A short Russian thriller from 2018, The Real Screenplay (Настоящий Сценарий) follows a young and successful screenwriter who is kidnapped by someone seeking revenge for the death of his pregnant wife. The kidnapping doctor believes that the screenwriter is responsible for how his life has turned out: the doctor sees a presentation given by the screenwriter where the doctor and his wife are described in the minutest detail. Could it be that everything the screenwriter writes comes true? Co-written and directed by Sergey Znamensky, The Real Screenplay represents Znamensky’s directorial debut and asks questions on who or what is responsible for one’s actions: fate, man or God? The original score is written by Andreu Jacob. Born in Barcelona and now living in Norway, Jacob has been a prolific musician and composer for a number of years, writing several classical pieces including a number of symphonies. He is particularly involved in the use of new technologies and multimedia to create his music. He has composed music for several short and feature-length films including the recent Swedish short films, Sanctuary (2017) and Humans (2018). 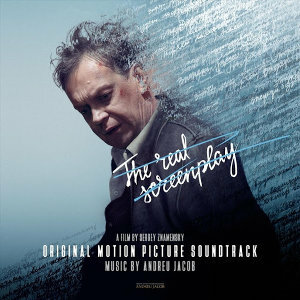 Jacob’s score for The Real Screenplay appears to be centred on an aural collage of musical ideas that’s held together by an over-reaching sense of tension and disorientation. A myriad of these musical ideas and orchestration effects combine together and leads to the listener of the score finding it difficult to truly relax. The opening cue, appropriately titled “Introduction”, opens with tense, broody strings that form a base onto which a number of short disorientating effects are added: a slightly off-kilter string solo, rumbling synths, brass glissandi and carefully placed tinkling piano motifs (reminiscent of those short piano motifs heard during the atmospheric scenes in early Christopher Young scores such as Jennifer 8) are all combined to build the sense of unease. The Real Screenplay is at its strongest when Jacob combines his various motifs and ideas together to create a tense feeling where the listener is not quite sure what’s coming next. Even when he adds metronomic rhythms (e.g., “Sharing Thoughts”, “Who Is Writing Now”), these only build the tension because you’re never very sure when the seemingly solid rhythms all going to collapse. In the middle of the album, “First Impact” followed by “Vase”, illustrate this technique particularly well. With the former cue, “First Impact”, tinkling piano, metallic percussion/synth tones and various dissonant colours establish the unnerving sound and then ominous low strings join in with their driving rhythms. Cacophonous brass and pounding percussion punctuates the end of the track alongside tremolo strings and glissandi horns. The forward momentum continues with “Vase”, but this time writhing solo strings, metallic screeches combine with the strings to continue the unease. Reading back my words, it all doesn’t sound very listenable; it sounds a bit too much like today’s horror scores that rely too much on ‘stingers’ and soundscapes to instill feelings in the listener. But that’s not the case here though. Jacob’s score feels a much more measured beast where thought has gone into each of the ideas and sounds that are used and also where they are placed. Taking the time to think things through makes it all very listenable. It’s not all about atmosphere and unbalancing the listener. Early in the score, “Yulia” features piano that, despite being an hypnotic, repeating motif, gives the score a somewhat human touch. “Pregnancy” is probably the most sympathetic track on the whole album. Piano and strings playing an emotionally charged passage (I hesitate to use the word ‘theme’) and wordless voices add an ethereal feel. “Broken Life” uses brighter strings with the piano for another emotional track but this time it’s a more tentative display of emotion. Interestingly, as the track progresses the loveliness of the strings/piano is consumed by dissonant strings and synths so that, when the strings and piano return later in the track they have now been contaminated and there’s a slight unsettling quality to their previously lovely music. By the end of the cue, it is the dissonance that dominates. And once we reach the end of the album, the piano is now broody and the strings have a devilish quality to them (“There Is No Final Here”). Tracks such as “Timer”, “Pregnancy”, “Nobody Can Return To Me” and “Who Is Writing Now” feature significant vocal performances. Wordless choral voices feature in both “Timer” and “Pregnancy” with the former track featuring aggressive choral stabs that adds to the cue’s dramatic crescendo. “Timer” (aptly titled for the presence of a truly creepy clock motif) also features a segment of deep solo male voice seemingly reciting some Russian incantation-style text. The solo male voice is a recurring presence towards the end of the score (“Nobody Can Return To Me”, “Who Is Writing Now”). The album closes with “Don’t Give My Words Back”; a meandering song accompanied by contemporary synth rhythms that has all the hallmarks of an end credits song. This is an interesting score from a film that I am unlikely to see. Jacob’s choice of instruments and musical ideas, together with a restrained quality to the score, is what gives the music its interest. The Real Screenplay is not a score that has much in the way of thematic material that will stay with the listener once the album has finished, but it is likely to linger nonetheless because of the interesting orchestration and musical ideas. The score is available from the usual digital outlets and audio clips can be found HERE.